With an enduring dedication to quality and precision, discover a distinctly British heritage brand with Viyella and smarten up your style credentials. Established in 1784, Viyella came crashing into life by creating the world's first branded fabric, shooting them to fame...which was quickly followed by the execution of sophisticated and timeless clothing for men and women - with every piece an impeccably stylish investment for your wardrobe. This brand's commitment to style and quality is noted in every stitch, it's built in to the DNA of every single product for a lasting wear that will shift between seasons effortlessly, including traditional colour palettes that are interspersed with trend-led tones and a mix of signature prints. Notably famed for their distinctly premium shirts, our collection of menswear showcases premium designs in elite fabrics that boast heritage prints, in addition to Viyella's iconic 80/20 wool and cotton blend textile that feels incredibly luxurious and superbly comfortable. Sumptuous knits in handsome designs are crafted from the softest wools that are as strong as they are luxury - all completely versatile pieces that can be layered to suit your personal preferences and the occasion. From the humble beginnings of a fabric mill to commissioning garments for the Royal family, this remarkable brand have put themselves on the map and are here to stay. Explore the quintessential Britishness of Viyella and inject your wardrobe with a dose of renowned style, from a long-standing name that has a serious hallmark of quality. 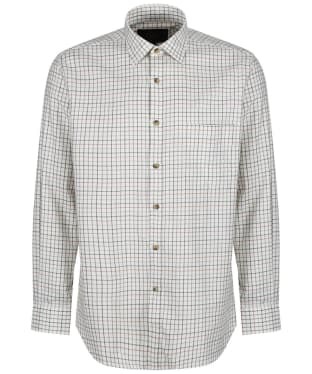 The Men's Viyella Lovat Tattersall Button Down Shirt has been crafted from a cotton and wool blend that brings together Viyella's signature fabric combination of durability, and softness that improves with age, making it likely to become your favourite shirt for both office and off duty day's season after season. The combination of cotton and wool work together to create an intimate blend that promises to keep you “Warm when it's not and cool when it's hot”. This shirt is embossed with Viyella's Classic Tattersall check in varying shades of Lovat, Grey and Gold, giving you a stylish and colourful look that will look great worn on its own or over your favourite jacket or sweater. Also featuring branded Viyella buttons, a button down collar, a functional chest pocket matched to the design and an adjustable cuff, this shirt is as functional as it is fashionable, and is a must have this season. 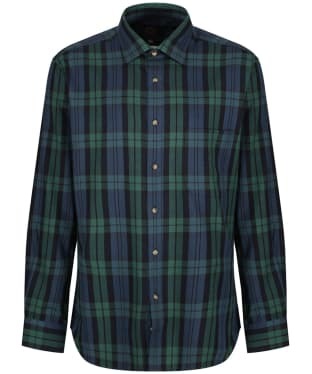 The Men's Viyella Lovat Green Tattersall Shirt has been crafted from a cotton and wool blend that brings together Viyella's signature fabric combination of durability, and softness that improves with age, making it likely to become your favourite shirt for both office and off duty day's season after season. The combination of cotton and wool work together to create an intimate blend that promises to keep you “Warm when it's not and cool when it's hot”. 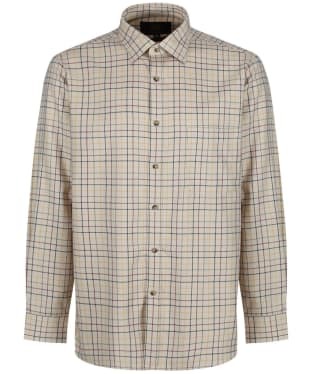 This shirt is embossed with Viyella's Classic Tattersall check in varying shades of green and brown, giving you a stylish and colourful look that will look great worn on its own or over your favourite jacket or sweater. Also featuring branded Viyella buttons, a functional chest pocket matched to the design and an adjustable cuff, this shirt is as functional as it is fashionable, and is a must have this season. The Men's Viyella Coloured Ground Tattersall Shirt has been crafted from a cotton and wool blend that brings together Viyella's signature fabric combination of durability, and softness that improves with age, making it likely to become your favourite shirt for all occasions. The combination of cotton and wool work together to create an intimate blend that promises to keep you “Warm when it's not and cool when it's hot”. 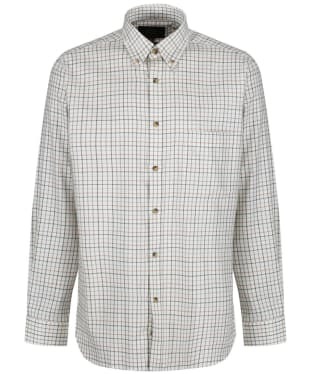 This shirt is embossed with Viyella's attractive Classic Tattersall check, giving you a stylish and colourful look that will look great worn on its own or over your favourite jacket or sweater. Also featuring branded Viyella buttons, a functional chest pocket matched to the design and an adjustable cuff, this shirt is as functional as it is fashionable, and is a must have for your wardrobe this season. 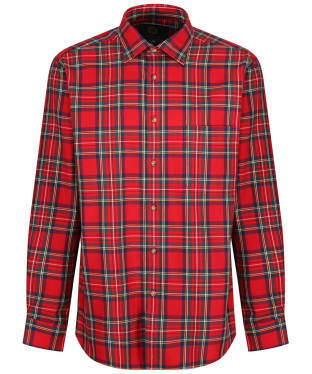 The Men's Viyella Tartan Shirt has been crafted from a cotton and wool blend that brings together Viyella's signature fabric combination of durability, and softness that improves with age, making it likely to become your favourite shirt for both office and off duty day's season after season. The combination of cotton and wool work together to create an intimate blend that promises to keep you “Warm when it's not and cool when it's hot”. 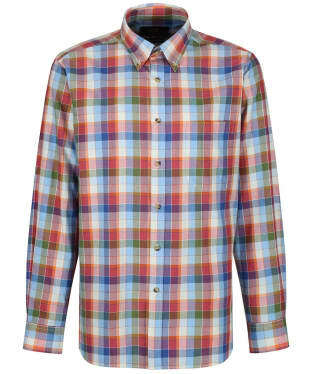 This shirt is embossed with an impressive tartan pattern for a stylish and colourful look and will look great worn on its own or over your favourite jacket or sweater. Also featuring branded Viyella buttons, a functional chest pocket matched to the design and an adjustable cuff, this shirt is as functional as it is fashionable, and is a must have this season.